Home » Benfica , Brazil , DC United , EC Bahia , Freddy Adu , MLS , Real Salt Lake , Twitter » What the Hell Happened to Freddy Adu? 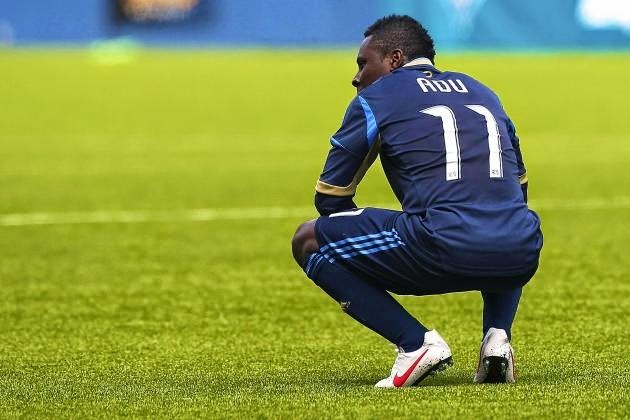 Bursting onto the scene at 14 years of age when he became the youngest athlete in American history to sign a contract with a professional team when he joined DC United in 2004, Freddy Adu's career has been disappointing to say the least. After two reasonable seasons with DC United, and a half season with Real Salt Lake, Adu left the MLS to join Benfica in Portugal and from their his once promising career has spluttered from one location to the next. Now 25-years-old, the one time projected saviour of US soccer, who was even quite ridiculously referred to as "the new Pele" for his performances as a youth player, has apparently been dumped by Serbian club FK Jagodina. After not making a single appearance for the club in his six months in Serbia, following only 59 minutes played for his previous club EC Bahia of Brazil, it's difficult to see where Adu can go now to resurrect his career. Wherever the truth lies, it's another disappointing chapter in the career of a player who was so highly touted as a youngster, but has sadly failed to fulfill his potential. Once again it looks like a case of a combination of too much too soon and too much hype when it comes to the career of the Ghana born former US international.